This post is written by Claudia Plumley, marketing manager for Experience Columbus. They say you can’t go back in time, but that’s not always true. My husband and I re-lived life in the 1800s Canal Era - and one of our first dates − at Historic Roscoe Village earlier this summer. Historic Roscoe Village is just as charming as it was 21 years ago when my husband and I first started dating. In fact, it’s even better. The village buildings are filled with either re-enactors or cute specialty stores, offering everything from cooking classes to the largest Vera Bradley selection I’ve ever seen. Our guide, who’s been working at Historic Roscoe Village since long before our first date in 1991, took us around the village. We saw a blacksmith creating a beautiful copper soup ladle, learned how to make a broom and took a spelling test in an old school house. The most memorable moment, though, was meeting the doctor who showed us the gruesome tools used to pull out tonsils and teeth in the 19th century. I’ve never been so grateful for modern medicine. We saw first-hand what life was like onboard the canal boats, too. 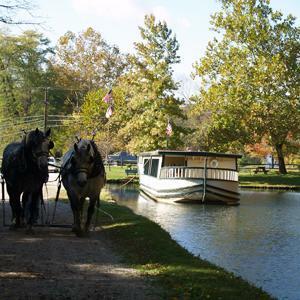 A boat is permanently located in the village, and the horse-drawn Monticello III offers rides up and down the Ohio-Eric Canal all summer long. You can even walk inside a restored canal lock to see just how deep they were. Many people lost their lives building Ohio’s canals, and you can understand why when you stand at the edge and look down. But a trip to Historic Roscoe Village isn’t complete without tasting the onion rings at The Warehouse Steak n Stein. We sat outside and inhaled a full order of onion rings – the most popular dish on the menu. Coshocton is just 90 minutes away from Columbus, so it’s an easy day trip. But it’s well worth staying the night. We opted for Caroline&apos;s Place, a new lodging option located overtop one of my favorite stores, Medberry Marketplace. We stocked up on Amish-made cheese and tasty crackers from the speciality grocery, then took it up to our full kitchen. The building served as a hotel during the Canal Era and as a shelter for fleeing slaves on the Underground Railroad. Sleeping in a piece of history was the ideal way to end our trip.